The entire book is presented here on this web site. You may read it all here, completely free of charge. 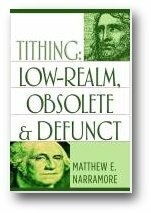 Tithing: Low-Realm, Obsolete & Defunct is now available for purchase in Kindle eBook format in addition to the original print edition. Giving is the nature of life in Christ but it has nothing to do with tithing. Tithing is an obsolete mentality that is not part of our new relationship to God through Christ. Tithing is not a neutral option. The tithing mentality distracts people from the real nature of our relationship with God: organic spiritual union, sonship and 100% commitment. The tithing mentality hinders people from being led and empowered by the Holy Spirit. Common statements used to promote tithing. Click item–to read In-Christ perspective. The tithe is the Lord's. If you don't tithe you are a God-robber. A curse will come on you if you don't tithe. We are commanded to prove God with the tithe. The tithe is the connection to the covenant. The tithe redeems the other 90-percent. Tithing qualifies you to receive more from God. "Honor the Lord with your substance and with the firstfruits of all your increase" means to tithe. Tithing puts God first in your life. Tithing began in the garden of Eden. If you don't tithe, God will take that 10-percent from you. If everyone tithed, churches would have plenty of money. Heaven will be shut up against you if you don't tithe. Miracle testimonies prove that tithing is God's will. We have a completely different and much better relationship with God than Abraham had. It calls for a totally different way of living and giving—led by the Spirit and tailored to each person uniquely and individually. See Notes for scriptural references for each statement. Understanding what it means to be in Christ is the key to understanding why tithing is not part of the New Covenant. In Christ, we are no longer just servants of God who live by laws and principles as people did before the cross and the resurrection. We are now spiritually re-born of God and live by the indwelling Christ himself. Tithing was instituted for people who had a different relation to God than we now have in Christ. Tithing is inconsistent with the most important aspects of the New Covenant and the believer's new nature in Christ. This book examines all the arguments for tithing and compares them to the finished work of Christ at the cross. It explains who we are in Christ and how we can be led by the Spirit in our giving. What it means to be in Christ and our relationship to God as sons. The difference between living by Christ and living by laws and principles. Why God has ordained freewill offerings instead of tithing for the church. Why tithing contributes to spiritual weakness in the church. What the Bible actually says about tithing before, during and after the Law. Where the Bible clearly shows that tithing is not a universal principle for all times. How the grace of freewill giving has always exceeded tithing, even during the Law. A New Covenant paradigm for living and giving. Twenty-six New Testament reasons to give that have nothing to do with tithing. I was taught to tithe as a child and did so for many years without question. It was never a problem to me, spiritually or financially. I thoroughly agreed with the teaching and wasn't looking for any reason to contradict it. However, after many years of seeking God and studying his word, I have come to see the doctrine of tithing, and all other financial giving as well, in a new light—the revelation of the mystery of being in Christ. Tithing is not for the church. It was never intended for men and women who are born again and filled with the Holy Spirit. It is considered to be a mark of spiritual commitment, but it's not spiritual. The devil doesn't mind tithing. He welcomes anything that will take our attention away from the truth in Christ. Tithing is an emotional subject and passionately proclaimed to be many things: an eternal law of God, a divine principle of prosperity, a matter of honor, a financial duty, an expression of gratitude, an act of obedience. Every one of those positions is held with complete sincerity, but for a born-again believer in Jesus Christ, who lives under the New Covenant, they are all sincerely wrong. The cross of Jesus Christ not only established a New Covenant, it also gave birth to a new kind of spiritual person. The new man in Christ is in a new spiritual realm and relates to God in a way that is totally different from anyone who lived before the cross. The church has failed to understand the new way of living that God initiated in Christ. Tithing is just one aspect of the failure, but it is highly emphasized and it creates a great distraction from the truth. Most of the church today is living by an Old Covenant paradigm—their spiritual perspective or theological framework for thinking and relating to God. Although they say they are not under the Old Covenant, most Christians are trying to relate to God from a perspective that is based on the Old Covenant. They take all the facts they know about Jesus and try to fit them into spiritual patterns they see in the Old Testament books of the Bible. The church needs to make a complete paradigm shift from the Old Covenant way of thinking and living to the New Covenant way. Mixing the two doesn't work. It's like putting new wine into old wineskins. The result is a dysfunctional system of religion, which most people consider to be normal Christianity, but is not what God intended. Tithing is one way that Christians mistakenly try to express their new nature in Christ through an obsolete system of worship and financial stewardship. Tithing is not part of the New Covenant. There are many scriptural reasons why it isn't, why it can't be, and why God's plan for New Covenant giving is far superior in every way. Tithing is not an eternal principle or mandate from God to be followed today. It has been misinterpreted to be those things because the church has failed to comprehend the new way of living that began at the resurrection. The tithing doctrine contradicts the true message of life in Christ as a son of God and contributes to spiritual weakness in the church by holding it in a low spiritual realm. The story of Abraham and Melchizedek has been taken out of context and distorted to create a doctrine that contradicts the New Covenant and promotes an inferior way of living. The story of the tithe in Jacob's life is an example of ignorance, unbelief, and foolish bargaining with God. There is no reason for a believer in Jesus Christ to follow Jacob's example. Much of the erroneous teaching on tithing reflects a misunderstanding of tithing during the Law. Even though people say that they are not preaching the Law, almost every scripture that is used to teach or promote tithing is from the Law or was speaking to people who were under the Law, not to the church. Inadequate study of the Bible leads to the conclusion that tithing was after the Law and is still God's plan for us today. The glorious way of life that God has given the church through Jesus Christ exposes the tithing paradigm as being weak and beggarly in comparison. The New Covenant paradigm for financial stewardship and giving is based on a completely different spiritual paradigm than the tithe and is far superior to it, just as the New Covenant in Jesus Christ is far superior to any previous relationship between God and man. The church has been defrauded of its glorious spiritual inheritance in Christ by spiritual disinformation—wrong doctrine that destroys the power of Christ's work on the cross. The tithe redeems the other ninety-percent. Tithing qualifies you as a steward to receive more from God. When Jesus died on the cross, God was paying his tithe. If you don't tithe, God will take that ten percent from you. The born-again man has been crucified, buried, resurrected, and seated with Christ at the Father's right hand. He has been made the righteousness of God in Christ and is spiritually designed for a different way of living than was known before the resurrection. In Christ, we are sons of God now. The Father's will is to bring us to the full spiritual stature of Jesus Christ. Tithing was ordained for people who had a different kind of relationship to God. Tithing is not a neutral option. It's part of a low-realm, obsolete, and defunct religious mentality. It hinders the church by obscuring and negating the truth of what it means to be a son of God through spiritual union with Jesus Christ. Hebrews chapter 7 does not teach or support the doctrine of tithing for the New Testament church. It has been misunderstood and misrepresented. The best part of your book was the exciting news of the finished work of the cross. As a church Pastor I would like to put some of these books into the hands of others in my circle of influence. THANK YOU FOR YOUR BOOK ON TITHING--it spoke to much more than just the fallacy of tithing. I was under the system of mixture of grace and law for the majority of my Christian life. I now give by faith and give cheerfully. You are not slamming the church, only speaking the truth in love. But the truth of who we are in Christ and what we have in Him is incredible! I would like to compliment you on your excellent Christ-centered writing on the whole issue of tithing. I agree. It is time to speak out. Tithing has become a fundraiser like indulgences were in the days of Martin Luther. I read the book and my life has changed. The revelation of our full standing with Jesus as sons of God was for me the pivotal moment in the study. This book helps to reveal the open door of freedom and abundance from living in Christ. Hallelujah for the glorious "true gospel" of grace in our Lord Jesus Christ! Your book gave me the Bible based teaching I needed. I was saying YES, YES, YES, all the way through. To read more from these writers plus others, go to Mail page. Copyright © 2004–2012 Tekoa Publishing, All Rights Reserved.